Just something I noticed in Postbox just now - when I select a thread, it marks every message as read whether or not it was actually displayed. I think the important thing here is separating "I'm done with this" from "Read" - which is not the way clients are written these days. Read should just be metadata. It's OK to archive things I haven't read. 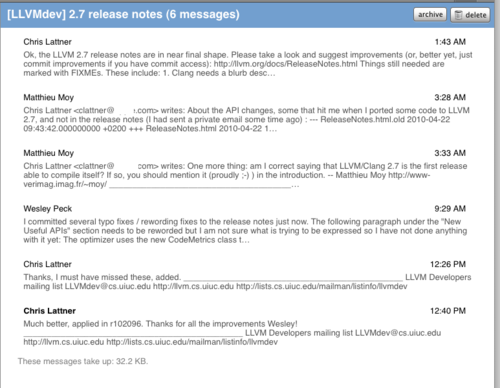 Here's a set of screenshots that show how conversation view can help keeping up with a public list. 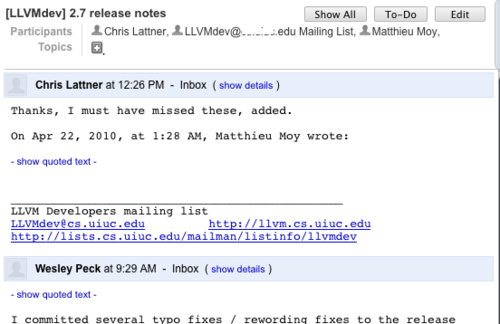 I've been subscribed to the LLVM-dev mailing list for years in GMail, and for about a week in my mikechecksmail test account. 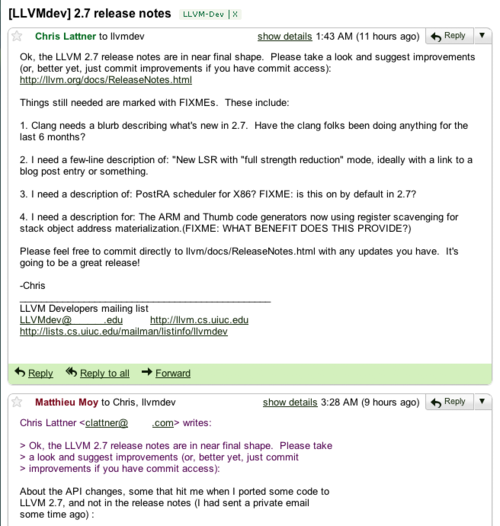 I'm not active in the LLVM project - it's just something I want to check in on occasionally. (For a while I had a filter that popped up any mention of Fortran). So when I check in, I want to skim the threads and read anything that's interesting. Usually that means I'm finding a thread that's already pretty long and I'm reading the whole thread from the beginning the first time I see it. I'm interested to hear if that's not how you read public high-traffic lists - do you try to keep up with all the threads as they come in? I did that for a while, but it's hard to keep up with and probably isn't actually your job. So, with that workflow in mind, how do our clients fare? But in my judgement, barring some natural language analysis, the best default is to collapse and let the user click to expand quotes when necessary. If you select "Show Conversations" in the "View" menu, Postbox shows something like a conversation-view when you select an entire thread. If you don't have that option on, or you select more than one message in any other way - like shift-or-command-clicking multiple messages, you get a blank content view. Not very useful, but a minor point - after all, GMail doesn't really show the list in the same page as the content anyway, so they've avoided that design problem. The major problem with Postbox's conversation view - for this list-catchup task - is that it sorts the messages with the newest ones at the top. This is exactly the wrong thing for reading a whole thread, and I couldn't find a way to change this sort order. There are a couple other minor nitpicks - the info pane with the sender and links on the right-hand side only shows its info for the most recent message - if you want that info for another message, you have to select just that message in the list view. If you're still looking at the thread when new messages in that thread come in, it'll give you a nice alert and lets you refresh the view, but then the problem is still there - it's up to you to see what's new. Thunderbird 3 has a summary view, but it's not thread-centric. It just shows the sender, date and first few lines (smashed together without newlines) of each message you've selected. If you select a thread, it's kind of like a conversation view, but if you select multiple unrelated messages, it'll just show the messages in order. Clearly there's some room for improvement there. I won't pick on it too much, except to say that smashing the text together for a summary makes this view basically useless. This isn't sloppy like Thunderbird's view, but it's not very useful either. For this and other reasons, keeping up with public mailing lists in Apple Mail is pretty painful. That's why I moved most of my list subscriptions over to GMail a few years ago. I've grabbed a copy of Postbox, so I can add it to the list of clients I'm poking around. It's cross-platform, based on Thunderbird, so it shares a lot of its foundations, such as a tabbed, multi-pane interface. The settings in particular are very similar to Thunderbird 3, with just the occasional tweak. However, they've clearly put a lot of effort into a nice face-lift and some added features. Some of the features remind me of Chandler, such as the ability to quickly make a message into a 'todo', and to edit messages in place. I'll be curious to see how many of these differences work. Editing messages in place doesn't seem like something I'm ever going to want to do, but I'd be interested to hear why someone else would. They've also added twitter and facebook support, which I haven't investigated yet, but at first kind of goes against my email client religion - I'm not convinced that adding new protocols is the way to make clients better. However, there's definitely a growing feeling that we have too many inboxes now. That's a theme echoed in the Mozilla Raindrop project, too. So maybe this will appeal to people who want everything dumped into one program. For now, I'm not sold. It's also one of the few clients you can actually pay for, which is interesting. 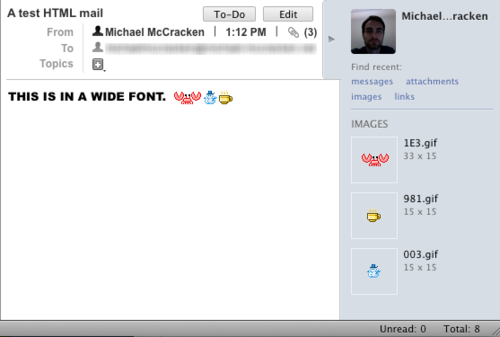 The model for allowing images in HTML mail is a small improvement on Thunderbird 3. You can allow it once, or just whitelist the sender - you will still get the sender as a full entry in your Contacts list, but it adds it quietly, without bugging you for the first name of Mr. Noreply. I guess I don't mind it as much, but contact list pollution still annoys me. Here's a screenshot of Postbox telling me it's blocked some images. You can also see their 'todo' and 'edit' buttons - to turn the message into a todo or edit it in place, and the summary pane on the right side that shows some info about the sender and lists links and attachments. In this screenshot, you can see it using that pane to list some attachments. 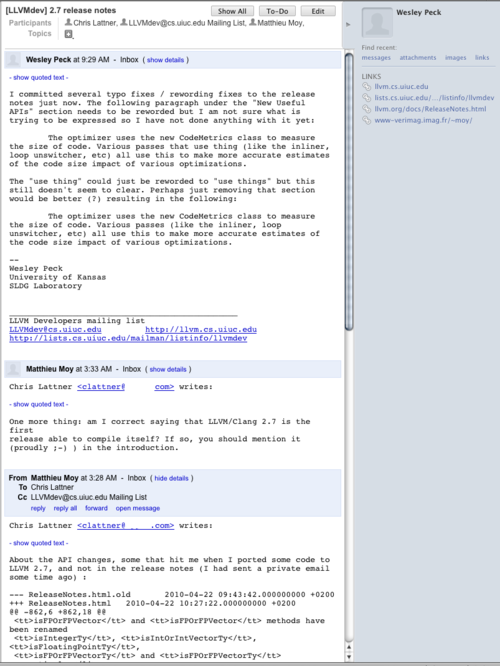 However, what it's listing is attached images that are used inline in the HTML message. I'd prefer that it didn't treat those as first-class "attachments", even though they technically are. Hi - Just a quick note that I added comments to this tumblog, so the six of us can have a nice chat about mail. You can also always trade thoughts with me at mikechecksmail at michael-mccracken.net. A little while ago I noticed the Mozilla Raindrop project. It's an interesting project in Mozilla Labs by the Thunderbird team. It's trying to rethink how messaging (in general, not just email) should work - using open web technologies. On the surface it sounds like Google Wave, but I'd say it's aiming a little lower - trying to take existing protocols and build software that handles them all together in a better way. I also think it's a better approach than Wave, focusing on designing a single artifact that people will want to use instead of a framework technology demo, which is what Wave always seemed to me. It looks like it's not intended to be a native desktop (or mobile) client - they mention running it on servers, and it depends on Python and CouchDB, which would preclude it running on the iPhone OS. One of the things I like about it is the way they're trying to use a classification of emails - obviously, not all mails are equal. They fall somewhere in a range between spam and important personal (or work) messages. A big class is "bulk" mail - mail that's useful but not necessarily of a conversation involving you. Mailing lists, promotional mails you've asked for, facebook/twitter notifications might all fall into this category, and it's a great idea for a mailer to do something different with them. At the least, it should let you ignore them if you're just trying to do a quick processing pass of new mail. The Raindrop design blog has some good posts (with plenty of screenshots) outlining their current approach. Marco Arment wrote yesterday about mobile computing being more exciting than what he called "Desk" computing. I'm a fan of Marco's writing, and I usually agree with him, but that post got me thinking. I can't argue that mobile isn't exciting, but I disagree with his assertion that desktop computing is a solved problem. He's right that the pace of innovation has slowed. Certainly the last couple of OS X releases have fewer and fewer compelling differences. In fact, I'm writing this on OS X 10.5 -- 10.6 didn't impress me enough to make me bother upgrading. Still, when Marco asks what I want out of 10.7, I think "what don't I want"? I think there's tons of room to improve on and even rethink the workstation. Maybe now that the consumer train has shifted toward more custom-designed tools for browsing, games, and social apps, there's room for workstation OSs to grow in ways that might improve them without worrying about leaving the home user behind (or boring them). I'm not asking for unintuitive design. What I'm asking for is powerful tools - system and apps - for people who use computers for work every day. I certainly hope that these power tools will be built with elegance and style. I'm not asking for dual cameras and four speakers. Market forces have limited development of crucial daily-use work tools to what will appeal to the home & leisure market. For instance, Apple ships Mail and iCal with the OS. Both are fine programs, but are clearly trying to ride the line between work features such as meeting planning, and consumer features like stationery. Meanwhile, the market for alternatives is limited, and even some of the alternatives have taken the approach of adding consumer-related features. Postbox, for instance, has added facebook and twitter support. That's not helping me get work done - quite the opposite, really. Like the personal jetpack, I'm still waiting for the system that knows what I'm trying to do and co-ordinates to help me get it done. The one that learns (even crudely!) about my habits and the time of day, my colleagues, their schedules, etc. The one with this knowledge baked in everywhere in the system. For instance, it knows which app's notifications can be ignored for later. As a start, I'd even settle for a single system that actually uses all the good ideas that have come up in the past 30 years. Let's at least catch up to Douglas Engelbart's vision of the NLS system for augmenting collective knowledge work before we call it a day. Good search everywhere has been a real improvement, but what about full support for smart annotations for files, events, people and other data? The BeOS file system comes to mind. Search is better when there's better info to search for. If I push it a little, some smart background prediction of categories for documents that'd help me find them later -- that couldn't hurt. Why doesn't a file know who emailed it to me? Another blast from the past - maybe OpenDoc was a stretch, but more open document formats and easier flowing data between applications isn't a bad idea - can we expand on that? This one ties in with mobile devices - Real, honest to god multi-computer network syncing. It can be done - it should be baked in! What if your filesystem was actually an easily merge-able version-controlled document oriented database like CouchDB? Can we use some ideas from distributed version control to make sharing documents on disconnected filesystems work right automatically? I still think the best solution doesn't depend on storing everything on servers (especially public servers). That leads to the oft-repeated idea of getting rid of "saving". I shouldn't have to commit changes - maybe I want to tag a version, but the data should always be written to disk. What about application and system scripting that really works - that's easy enough for quick things but powerful and fast enough to grow a real program from? Let me start them as visual or spoken one-off commands but then edit and share them as text. System support for Quicksilver/Launchbar/Ubiquity-style text command lines. Tie this into the scripting system. Make it feel like I tell the computer what to do instead of finding the right app to tell, opening it, etc. System-wide hypertext - I should be able to create robust links between document parts, messages, people, and other entities. It should be fast to view an annotated list of changes across versions of a document, showing who did them and what they said about it in emails. This shouldn't have to all reside on some central server to work. Apple Mail's "Send again" feature is handy - it takes a message and creates a duplicate of it, ready to either edit or re-send exactly as-is. It's a bit of a mystery, though, and I bet it isn't used much. The problem is that the wording and keyboard shortcut don't say enough about what's really about to happen. You could be forgiven for guessing that since ⌘-D sends new mails out onto the wire, it'll just send the old mail - unedited - out on the wire, too. There's no hint that you get to edit it. Also unexpected because of the name, the message doesn't have to be one you sent. If you invoke "Send again" on a message you received, you'll get a new message with the same recipients, from you. I'm having a hard time imagining why I'd ever use this. Maybe it'd save a copy and paste when sending a copy of something that I don't want to just forward, but that's a stretch. How often does that happen? It's a handy feature, but it needs a better name and a better shortcut. Why is it handy? Sometimes I write a draft of an email to the outside world, then send it to team members for review. Then later, I want to edit that draft, incorporate their suggestions and send it off anew. That's when I use "Send again". But I only discovered it by accident. Despite this use case, this seems like a feature that probably isn't worth the effort and extra UI clutter. Here's a post from the recesses of memory. … your feedreader, like your browser and email app, is a hub of information. It makes sense to want to route information from the hub to other applications. This is a great point - and I'd like to expand on it. I think it goes further than just being able to send data from your email client to other programs. Data should be easier to send in both directions. Most email clients want to be your only interface to your mail data. Since email communication can affect everything we do on a workstation, every program should be able to look at and update your email store, even triggering checks or controlling how you are notified of new messages. What program is better able to determine what you're likely focused on than the one you're currently using?